Just in time to make the midnight deadline for this sketch challenge. This one was a little bit on the technical side for me to figure out the size and placement of the stripes. I placed white strips down and then added striped washi tape on top. Adding the mittens on a square and finishing them with black matte brads from Bazzill. The stamp is from Hot Off the Press. Super cute! I love the little mitts! Thanks for playing along with Atlantic Hearts Sketch Challenge (AHSC). Really cute card. Love the color combo. 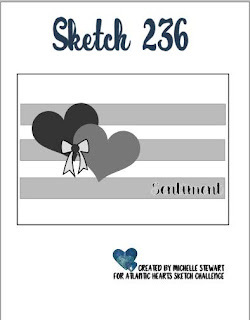 Thanks for sharing with us at Atlantic Hearts Sketch challenge. This is a gorgeous card. 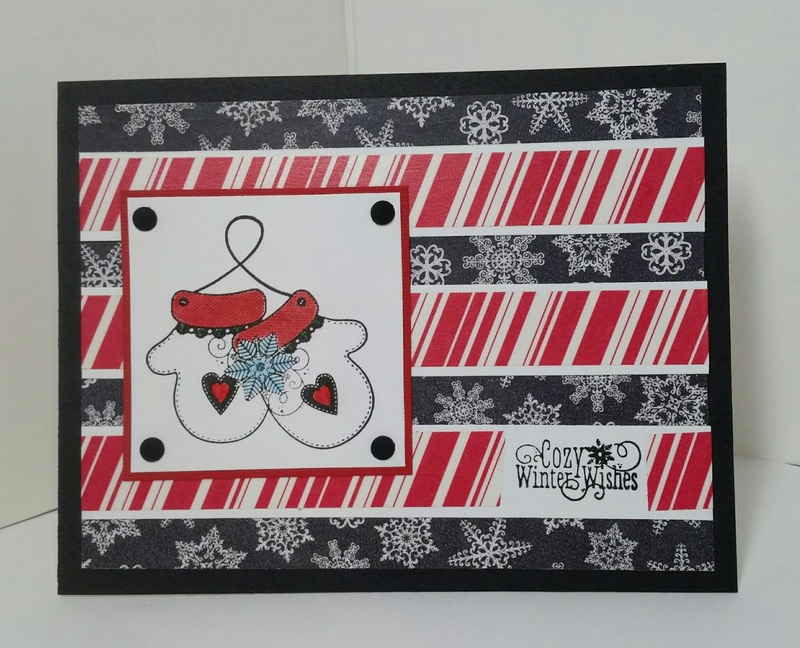 Love the cool, crisp feeling conveyed by the candy stripes and snowflakes. Those mittens are adorable. Thanks for playing along at AHSC! So pretty! Love the color scheme and you nailed the sketch for sure! Love it! thanks so much for playing along with Atlantic Hearts! So glad you made the deadline, Amy, this is an awesome card! The mix of black and white with red and white patterns and images is very striking but still balanced so neither overwhelms the other. Great job and thanks for sharing with us this week at Atlantic Hearts Sketch Challenge.